What a great creation! A wonderful way to keep all the "baby" items both flat and 3-D. I'll definitely order another when the next grandbaby arrives! Only wish they could be personalized before shipping. Looking for a gift for a new Mom and this is perfect. Nicely made, pretty colors and places for storage of so many of those baby “firsts”. Love this! Everything in one place and it's so classy looking. I have been so excited to get these for my daughters. Just got the first one and in an hour, I had transformed a storage box worth of stuff into this classy storage system, I love it! I would have liked some softer color choices though. I tried again a week before the baby shower, and it was back in stock! I ordered it and received it in time for the baby shower! I think it is a great idea. A had 4 children, and the old "baby books" didn't have a way to store the first lock of hair, baby hospital bracelet, etc., and they were probably lost forever. I love these. Beautiful. Simple. Finally organized all my sloppy, over-filled manila files of kids memories -- from my sonogram photos up through their high school report cards. Now every beat of their childhoods is chronological and fun to peruse. Baby teeth, photos of first hair cuts, art, birthday cards to them and from them. Only wish I'd been able to start earlier! I would have saved more judiciously. It's also the best shower gift I can think of. In an era of Insta and Snap, it's so nice to have tangible evidence of these fleeting moments. And with my eldest in 11th grade, I feel the speed of childhood profoundly. Thank you, Grommet and Savor! This set is perfect. The little drawers, the tiny envelopes. So often things like baby teeth and babies first hair cut get lost in the shuffle. 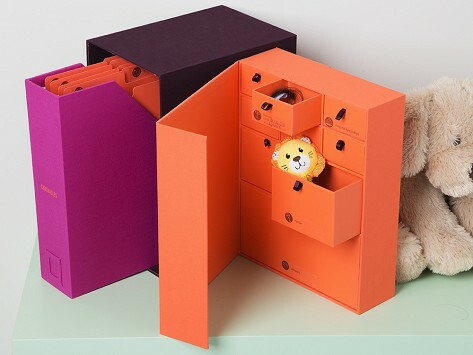 This ensures safe keeping and no searching for mementos ever. Can't wait to gift this to my God Daughter!